VietNamNet Bridge – The southern coastal province of Ba Ria-Vung Tau has approved Con Dao District’s proposal to ship domestic solid waste from the island to a landfill on the mainland. According to Le Tuan Quoc, deputy chairman of the province People’s Committee, trash will be compressed into packs weighing 450 kilogrammes each and shipped to Toc Tien landfill in Phu My Town before the rainy season starts in the south (around mid-May). 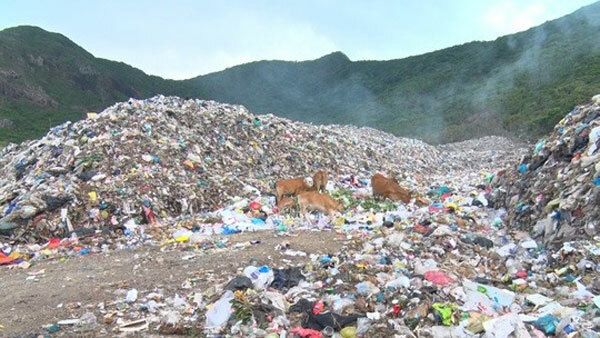 The Bai Nhat landfill on the island is almost out of space. The 3,800sq.m landfill has been used for more than 20 years and now has only around 300sq.m of space left unfilled. By the end of March last year 70,000 tonnes of untreated solid waste had piled up, severely affecting the environment and the nearby Bai Nhat beach. The island has only one garbage incineration facility which can burn up to five tonnes a day. However, 15 tonnes of domestic solid waste is generated daily. So on average some 10 tonnes remain untreated every day.